This is zoo is quite unique and the first of its kind in India where animals are kept in natural habitats (well I should say semi natural habitats). it's a wonderful parkland that spans across a vast 230 hectares forested land with elevations ranging from 6,500 t0 8,000 feet. 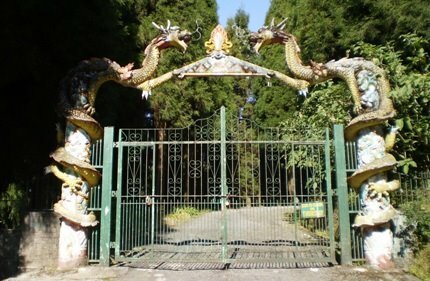 The entrance to the Zoo is at the end of a short pathway opposite to Ganesh Tok. It's about 6kms from Gangtok town. There is a 2.5kms long road that runs through the park. You can either choose to drive through (one way) or walk. If you prefer to walk, remember it's going to take a fairly long time. And in that case you should book a reserved car for about half a day to enjoy and experience the zoo. So what can you see? Actually a lot including many rare and endangered species of animals. Additionally you can see varied foliage from gentle grassy land to dense jungles. Animals available in the Zoo includes Red Pandas, Himalayan Black Bears, Snow Leopards, Clouded Leopard, Common Leopard, Leopard Cat, Tibetan Wolfs, Himalayan Palm Civets, Large Indian Civets, Gorals, Barking Deer, Yaks, Porcupine etc. You can also see different types of birds here like Golden Pheasant, Silver Pheasant, Lady Amherst Pheasant, Kalij, Satyr Tragopan etc. However since the area is very large and the animals are kept in open enclosures, you may not always be able to see them. You need to be patient and wait until they come out, if they at all do. You can see then from outside the wired fence. If you are walking, there are places to rest along the way including canopied weather shelters and benches. Other amenities include cafe and souvenir shop, wash rooms & drinking water points, a watch tower from where you get a panoramic view of the zoo area etc. Admission fee is Rs. 25/- per adult (for Indians) and Rs. 10/- per child. Entry fee for a small car is Rs. 40 and large vehicle like Bolero etc is Rs. 100. There is no additional charge for camera or video camera. The Zoo is open from 9am to 4pm daily (except Thursday). The information desk is at the ticket counter next to the entry gate. Hi Raj, I really appreciate your efforts to let people plan there trip in organized manner. I just wanted to know that zoo is situated in both places Darjeeling and Gangtok . Are Both zoos similar or both zoos have its own beauty? What about animals that are kept there..? Which zoo you would suggest to visit? Both zoos are great and have high altitude animals. Gangtok zoo is vast and stretches for miles. So if you can spare good amount of time (like half a day) and like to choose one, then visit Gangtok Zoo.